The European Handball Federation (EHF) and Infront Sports & Media, the federation’s exclusive marketing and media partner for the EHF EURO events, have announced a new record level of television coverage of the Men’s and Women’s EHF European Championships, both held in venues across Serbia. 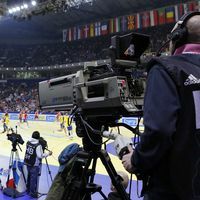 A total cumulative television audience of 1.85 billion followed the EHF’s flagship events in 2012, which were transmitted by 75 licensed broadcasters into more than 200 countries and territories. The coverage of the biennial events increased by 35 percent compared to the 2010 figure when Austria and Denmark/Norway played host and were watched by an audience of 1.37 billion. An upward trend was also registered in broadcast time, with 3,060 hours achieved, compared to 2,670 in 2010, an increase of 15 percent. The recently completed media evaluation of the Women’s EHF EURO, which took place from 4 to 16 December 2012, clearly demonstrated the global reach of the women’s event. The total broadcast coverage reached 1,161 hours, amounting to an increase of over 20 percent compared to 2010. Overall, a cumulative audience of 380 million was reached, compared to 335 million during the last edition of the event. There were also positive figures in markets including Norway, where the matches of the five-time European champions reached a 50 percent market share, and in Serbia, where up to two million people tuned in per match to follow the success of the host nation in reaching the semi-finals. Investments made to upgrade and further expand the online offerings for fans around the event are also proving valuable. The official EHF EURO YouTube channel registered 370,000 views, leading to 37,400 hours of video content viewed through the platform. In addition, the official EHF EURO website gauged 277,000 unique visitors and over four million page views during the event. Whilst the men’s event in January broke all records in terms of the onsite spectator numbers with over 300,000 fans following the action live, the Women’s EHF EURO 2012 in December also set a new match record with the semi-final clash between the hosts and Montenegro watched by 13,598 people, beating the previous record of 11,411 set during the EHF EURO 2010 semi-final in Herning, Denmark. The event was followed by the media worldwide with approximately 450 journalists and photographers accredited for the event and an overall total of 800 media representatives, with the host broadcaster included.